Based on Mordecai Richler’s prize-winning comic novel – his last and, arguably, best – the movie Barney’s Version is the story of Barney Panofsky (Paul Giamatti), a seemingly ordinary man who lives an extraordinary life. Told from Barney’s point of view, the film spans four decades and two continents, taking us through the different “acts” of his unusual history. There is his first wife, Clara (Rachelle Lefevre), a flame-haired, flagrantly unfaithful free sprit with whom Barney briefly lives la vie de Boheme in Rome. 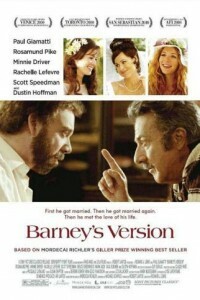 The “Second Mrs. P.,” (Minnie Driver), is a wealthy Jewish Princess who shops and talks incessantly, barely noticing that Barney is not listening. And it is at their lavish wedding that Barney meets, and starts pursuing, Miriam (Rosamund Pike), his third wife, the mother of his two children, and his true love. With his father Izzy (Dustin Hoffman) as his sidekick, Barney takes us through the many highs, and a few too many lows, of his long and colorful life. Not only does Barney turn out to be a true romantic, he is also capable of all kinds of sneaky acts of gallantry, generosity, and goodness when he least expects it.